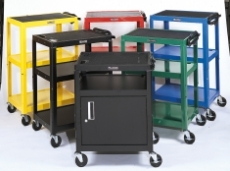 Adjustable height tables, either open shelf or cabinets tables that come with electric assembly. AVJ42C and AVJ42BC are available in black only. AVJ42 24"	 18"	 24"-42"	 4"	 41 lbs. AVJ42B 24"	 18"	 24"-42"	 8"	 48 lbs. AVJ42C 24" closed cabinet style	 18"	 24"-42"	 4"	 55 lbs. AVJ42BC 24" closed cabinet style	 18"	 24"-42"	 8"	 62 lbs.